Industry research shows that as much as 15% of a company’s fleet fuel budget is wasted by misuse and fraud. How can you regain that lost money? With a One-Card solution from Foss National. With one of our One-Card options, your drivers’ workdays are simplified: they don’t have to spend time selecting a vendor, they simply access our extensive nationwide network. And your administrative load is enormously reduced: instead of collecting, recording, and reconciling every fuel and maintenance receipt, you receive one annotated invoice. You can review and analyze every transaction with a host of online and offline activity reports. 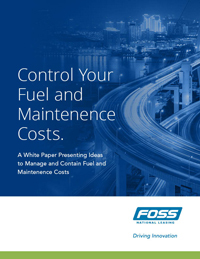 Built-in spending controls and purchase tracking —which can be combined with other technologies like GPS vehicle tracking—can nearly eliminate inappropriate or fraudulent fuel purchases. We manage your billing, so you can manage your business. For drivers, seeking approval for maintenance and repairs is time-consuming and stressful. With a One-Card solution from Foss National, vendors are pre-approved and repair authorizations are simplified, within pre-set limits. Beyond those limits, spending is pre-screened by certified technicians with access to each vehicle’s history, to ensure that repair decisions are appropriate and cost effective. Your drivers are back on the road faster, and your administrative overhead is cut to a fraction. Proper tire maintenance increases safety and reduces fuel consumption. By including tire purchase, service and off-season tire storage in your One-Card solution, you can provide convenient options to encourage drivers to maintain their tires—including inflation, periodic rotation, and seasonal tire changeover—for safety, performance and economy. Foss National is your source for advice on tire-related issues such as tire selection vs. OEM tires, all-weather vs. snow tires etc. Our reporting tools are specifically designed for fleet managers. You can analyze and report on cardholder details, transaction activities and spending patterns, to easily monitor and control your maintenance and fuel costs. Under our One-Card systems, card misuse drops significantly. One-Card solutions automatically limit fuel spending to what is reasonable, based on actual fuel use. When fuelling is excessive or improbable (in the wrong location or at the wrong time of day) transactions are red-flagged and administrators are notified. Because identity fraud and card theft is an increasing risk, our systems employ intelligent CardArmour technology that tracks purchase patterns and virtually eliminates the fraud and misuse that can be associated with fleet-related payments.